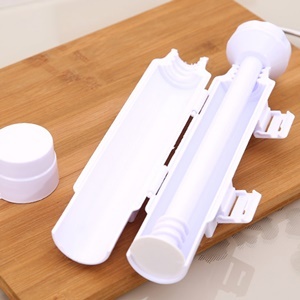 A sushi making kit is a handy tool that allows you to make all your favorite sushi dishes in the comfort of your home. Let’s face it. Sushi is expensive. Sure, it’s just some rice wrapped in seaweed, but when you order it in a restaurant, it could definitely leave a dent in your pocket. So if you’re a sushi lover, what do you do? Stick to once a month? No, use a sushi kit. Sushi making kits spare you the enormous bill and allow you to customize your own sushi according to your taste. However, it depends on the type of kit you buy. If you’re someone who knows their sushi, then you’ll definitely appreciate a good kit. The best sushi making kits on the market help you get the job done quickly and efficiently. They shouldn’t give you any trouble when it comes to rolling your sushi and of course, they should be safe and affordable. Since choosing your own sushi making kit can be difficult at first, here’s a list of some the best sushi kits on the market and what makes them special. Don’t be fooled by the fact that AYA headquarters are currently operating out of L.A. This Japanese company is as authentic and as genuine as it gets. 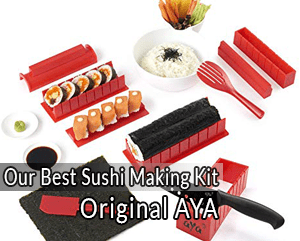 A lot of its products are in high demand but none are as popular as the AYA sushi making kit. This deluxe sushi making kit contains a total of 11 pieces, but they’re not all the same size and shape. You can choose between different shapes including heart, round, triangle, square, and so on. Basically, you can customize the sushi to your heart’s desire and present them whichever way you’d like. That being said, there are a few shapes and sizes that seem to be missing so it really depends on your preference and what you need. The AYA sushi making kit comes with a non-stick rice spreader. This allows you to spread the rice evenly before you roll the sushi in order to guarantee a homogenous taste. Not only does the AYA come with a rice spreader, but you also get your own chef knife to make the sushi-cutting process as smooth as possible. You basically don’t need anything else. AYA provides it all. One of the best things about the AYA sushi making kit is its simplicity when it comes to washing it. Forget the scrubbing and poking that comes with regular old sushi mats. All you need to do is thrown AYA into the dishwasher and you’re done! Let’s not forget that safety is just as important as versatility. The AYA sushi making kit is one of the safest kits on the market. It’s completely BPA-free and FDA approved. It’s also considered safe for both adults and kids. To make things even better, AYA provides YouTube tutorials that can help you with your sushi-making. They’re quite detailed and stay with you step by step until your delicious, homemade sushi is ready. Sushedo makes quite a few products but the most popular one yet is the Sushi Bazooka. Maybe people like it because of the playful name. Or maybe because it’s a very simple kit that makes some of the best sushi you’ll ever taste. Who knows? The Sushedo kit contains only 3 main pieces for making your favorite types of sushi. The first piece is a sushi tube, the second is a plunger, and the final piece is an endcap. Now you know why it’s called the Bazooka. Here’s how it works. Get the tube and add in rice and whichever kind of stuffing you prefer. Next is the plunger, which pushes the rice onto a receiving nori sheet. And there you go; you’ve made your sushi! The 3 pieces of the Bazooka come together to give you a stylish design. But attractiveness aside, you might find the Bazooka lacking in one or two areas when it comes to its design. For starters, the plastic material could be better. It’s kind of flimsy. Another problem is with the hinges that have to come together to close the tube. Sometimes they don’t meet correctly on both sides. Sometimes. Another issue that might matter to some people is sushi size. You see, the Sushi Bazooka’s tube is about 12inches long and 2.5 inches wide. You have to fill the whole tube up which can result in large pieces of sushi. If you’re someone who favors a smaller-sized sushi, this kit might not be the best choice for you. But if you’re into big, round ones that are super fun to make, then you should definitely try the Bazooka. The cleaning process is as simple as making the sushi. Just take the Bazooka apart and throw it right into the dishwasher. No need to get your hands dirty. Despite its playful name, the Bazooka is completely safe, even for kids. No sharp edges whatsoever. Plus, it comes with 100% recyclable craft cardboard packing. Your kids will have just as much fun as you do when it comes to the Sushi Bazooka. The Easy Sushi 8507 first hit the market in 2014. Since then, sushi lovers haven’t been able to get enough of it. People love its smart design and impressive functionality almost as much as they love the sushi itself! One of the things that set this sushi kit aside from the others on the list is its place of origin. The Easy Sushi 8507 is actually built in France. Perhaps that explains its unique and elegant, yet simple design. The components of the Easy Sushi are quite simple, even more so than the Bazooka. There are only two pieces: a roller and a traction sheet. The roller is 9.5″ long and 1.4″ wide. This will give you the standard sushi size you’re used to. So how does this kit work? Simple. Just fill the kit with all your favorite ingredients. After that, close the cover and pull the traction sheet. And there you go. Your sushi is ready. One of the best things about the Easy Sushi is its versatility. This little kit can be used to prepare all kinds of dishes such as rice paper, tortillas, crepes, and even leaf wraps. Who says a sushi kit should only make sushi? When it comes to safety, let’s just say the Easy Sushi 8507 is as safe as it gets. In fact, this kit is actually an award-winning product that has been patented by the company! The Easy Sushi 8507 is made from high-quality food grade plastic. That means that it’s completely safe to use. This plastic is made with strict standards to ensure that no harm befalls you or your precious sushi. Now that you’re finished with your sushi, you’ll want to clean up. The roller is simple: just put it in the dishwasher. As for the traction sheet, you’ll have to wash it yourself. But make sure you use something that’s non-abrasive! The traction sheet is actually uniquely designed and meant to be reused several times, so it requires special care. Of course, you can get a new one easily, but there’s no need as long as you take proper care of your kit. This Sushiquik is another kit that has been popular for quite some time now. The Sushiquik has 7 pieces in all: a rolling mat, a horizontal stand, a non-stick paddle, a training frame, a roll cutter and a couple of end caps. Each one of these pieces serves a certain purpose. For example, when you’re making sushi, you need something to support the detachable mat. That’s where the stand comes in. When you’re adding rice, it often falls off the nori sheet. The training frame helps prevent this. After you’ve filled up your kit with the ingredients, use the roll cutter to get some beautiful, symmetrical, and evenly-cut sushi pieces. If you’re feeling creative, you can even use the endcaps as bowls for serving your favorite soya sauce! The Sushiquik is quite versatile. 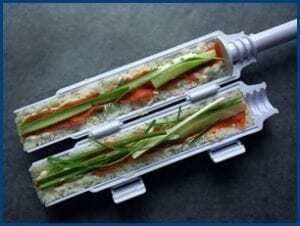 It can even be used to make inverted sushi, which is basically sushi with rice on the outside instead of the inside. 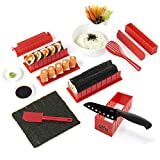 So if you’re someone who’s learning the basics of sushi making and feel like experimenting, this kit is great for you. When you get to the washing part, don’t worry. Just take the kit apart and toss it into your dishwasher because the whole thing is dishwasher-safe. The Sushiquik will definitely be an elegant, efficient, and useful addition to your kitchen. Here’s another excellent kit with a playful name. Sushezi is actually meant to represent two separate words: sushi and easy. Get it? This kit makes sushi making a breeze! The Sushezi is made of 3 pieces that help even the most inexperienced sushi makers craft their best dishes yet. It works similarly to the Bazooka, with a few minor differences in shape and appearance. The major part of the Sushezi is the tube which is 12 inches long and 2.5 inches wide. This might make the sushi pieces a bit larger than what some people would like, so it really depends on your size preference. The sushi making process is quite simple. All you have to do is stuff the tube with the rice and ingredients. But make sure the rice you choose has the right consistency. After that, plunge the contents right into your nori sheet and you’re finished! Enjoy! Now here’s something amazing about the Sushezi kit. Not only does it make “sushi easy” but it can also be used to make desserts! If you feel like having some crunchy walnut rolls, cake rolls, or biscuit cookies after sushi, this is the kit for you! 3-piece set: plunger, sushi tube, and end cap. When it comes to choosing the best sushi making kit, there can be quite a few options. There’s so much to choose from, it can be overwhelming. But there are a few factors to consider that can help you make an informed decision. The most obvious factor is the components of the sushi kit. How many pieces are included? Does it come with a knife? Is there a mat? All of these are things to think about. There’s no golden rule but generally speaking, the fewer the pieces, the simpler the sushi making kit is. Whether there are 11 pieces or just 3, you’ll still be able to make your sushi easily with a kit. It just depends on your preference. If you have your own sushi knife, then it shouldn’t matter whether it’s included in the kit or not. What you should be looking for, however, is what the kit is made of. Always choose a kit that is made from food grade plastic. It’s the safest. Some people don’t really pay much attention to the “post-sushi making” part. But when you’ve just had a delicious meal, do you really feel like cleaning and scrubbing the whole set clean? Choosing a set that is dishwasher-safe can definitely make your life easier. All you have to do is take it apart and let the dishwasher do its job. Kits that need to be manually cleaned can be a hassle and a nuisance. Sushi is one of the most nutritious and healthy meals you can ever order in a restaurant. But the problem is that it’s one of the most expensive meals to order, as well. Not to mention you could wait an hour for just a couple of pieces. Why spend so much time and money when you can make all the sushi you want in the comfort of your home? A sushi making kit can make your life much easier. All you have to do is decide what kind of kit you want. If you’re having trouble deciding, why not choose one of the 5 kits on this list? They have a ton of impressive reviews and they’re practically glowing with positive feedback. Get your kit and start rolling your own sushi today.